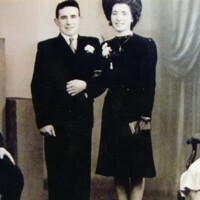 A picture of Rosemary McCloskey's parents on their wedding day. 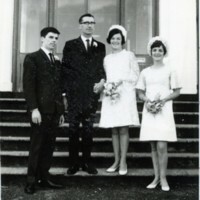 From left to right: William McCloskey (best man) Jackie and Sheila McCloskey, Rosalin McMacken (bridesmaid). 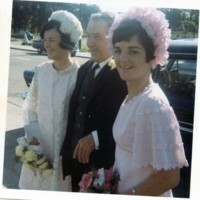 A photo of Maura Corr as bridesmaid at her sister's wedding. 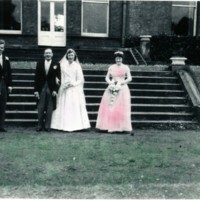 This is Avril Patterson on her wedding day with her husband Tom, her brother Basil and her bridesmaid, Margaret.